1. Cut the potatoes into ¼ inch slices. Tip: Many recipes call for pealing the potatoes. Most of the nutrients of a potato are in the skin. I try to not throw away the bits that are good for you. If the peel is thin and fairly unblemished, I usually prefer to leave them on. 2. Put the potatoes in a large bowl of cool water, with just a touch of lemon juice, to rinse off the excess starch. Tip: In addition to adding a touch of flavor, the lemon juice prevents the potatoes from turning brown from oxidation. 3. Drain and pat dry. Let the potatoes air dry for twenty minutes. 4. Pre-heat your oven to 400º F.
5. Put the olive oil in a small bowl and stir in the crushed garlic. 6. Brush some of the oil onto a casserole and arrange the onion slices over the bottom of the dish. Tip: Use a casserole with a lid. If you do not have one you will need aluminum foil to cover the casserole later. 7. Drizzle about a third of the remaining oil over the onions. 8. Sprinkle the wine over the onions and sprinkle about a third of the herbs and peppers over the onions. 9. Arrange the potatoes in an overlapping spiral over the onions. 10. Brush the remaining garlic oil over the potatoes. 11. 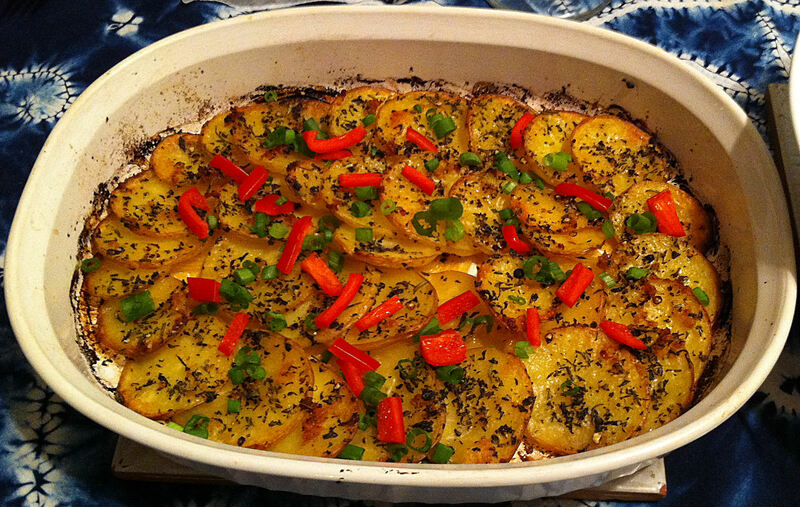 Sprinkle the rest of the herbs and pepper over the potatoes. 12. Put the lid on the casserole and bake for 30 minutes. 13. Remove the lid and sprinkle on the salt. Continue roasting the potatoes for 20-30 minutes, until the tops are beginning to brown well. 14. Garnish with the green onions, red bell peppers peppers and serve.